The UCLA/Getty Program is pleased to welcome Bianca Garcia as the new Program Manager for the Andrew W. Mellon Opportunity for Diversity in Conservation. Bianca is a Paintings Conservator. She received her B.A. in Art Conservation from the University of Delaware, and her M.S. in Art Conservation from the Winterthur/University of Delaware Program in Art Conservation. She has worked at the Balboa Art Conservation Center, Cleveland Museum of Art, Museo Nacional Centro de Arte Reina Sofia, Western Center for the Conservation of Fine Arts, and the Museo de Arte de Puerto Rico. To find out more information on the Opportunity for Diversity in Conservation or to get application details for the upcoming workshop to be held in July 2019, please visit: uclagettydiversityinitiative.wordpress.com. 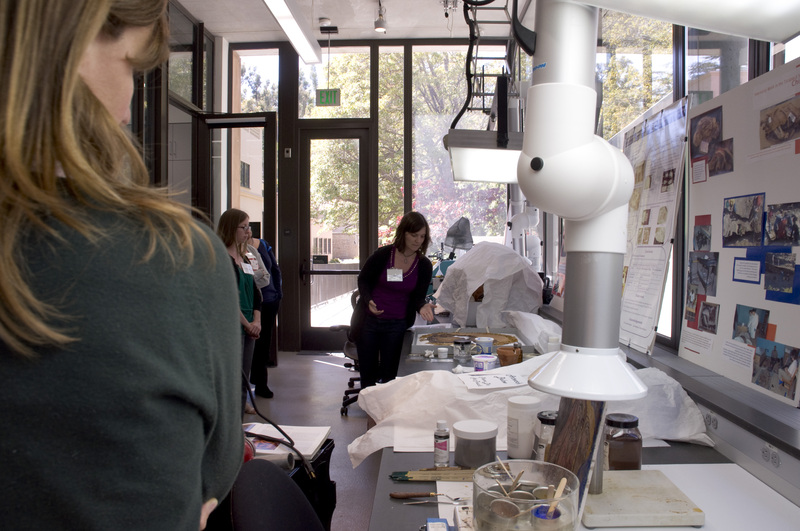 Categories: Uncategorized | Tags: conservation, diversity, Mellon Foundation, workshop | Permalink. In spite of our busy schedules (especially at the end of our first year, when many projects and treatments are being completed), the students of the UCLA/Getty Conservation program attended this wonderful workshop designed to encourage younger tribal members to pursue fields related to museum and archival work. The workshop began bright and early at 9:00 am. The first speaker was Wendy Teeter, Curator of Archaeology at the Fowler Museum at UCLA. Wendy spoke about her experiences collaborating with tribal communities and the museum’s dedication to serving Los Angeles tribes. The second speaker was Ruth Bayhylle, (Pawnee/Choctaw) UCLA PhD candidate in Library and Information Studies. The students caught a rare glimpse of Professor Ellen Pearlstein’s other life as faculty in the Library and Information Studies program, where she served as Ruth’s advisor. Ruth took us on a visit to various tribal collections where she worked on archiving maps and transcribing interviews. It was interesting to see how various tribal collections are housed, and we even got to see some objects in the background of the pictures. The third speaker was our very own Ellen Pearlstein, Associate Professor, UCLA/Getty Program. Ellen introduced the basic concepts of conservation education, emphasizing her belief that cultural values should be included as an essential component in conservation. 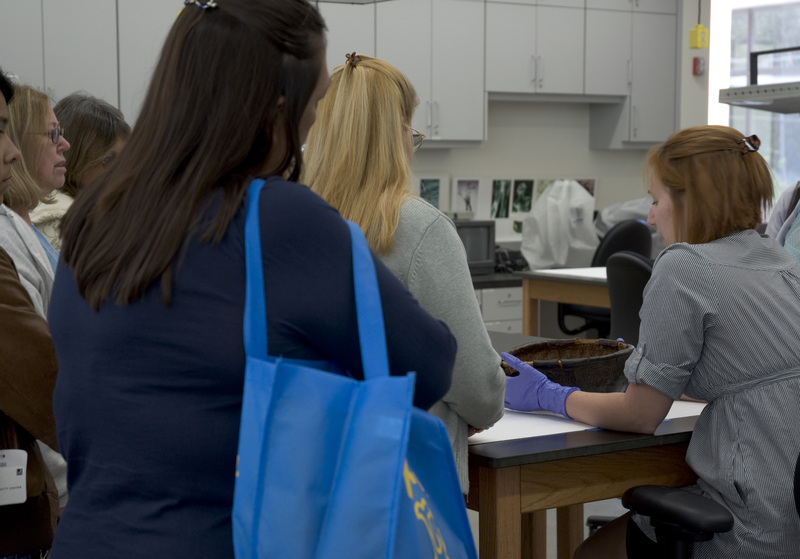 Next to speak was Molly Gleeson, UCLA/Getty Conservation Program, class of 2008, who presented various educational and training resources for the care of tribal collections. Molly did an impressive job of compiling a wide array of resources that included formal MA programs, free how-to videos available on the web, and training programs that will accommodate the schedules of tribal members with responsibilities in their community. Lunch was provided by our friends at Bon Appetit, the restaurant at the Getty which has single-handedly ensured the students of our program were cared for with proper sustenance this last year, for most of us have been too busy for menial tasks like preparing meals. After lunch, Özge Gençay Üstün, UCLA/Getty Conservation Program, class of 2008, presented on the detection of residual pesticides in collections. This is a very important topic, since in the past many museums routinely treated ethnographic collections with pesticides, some of which are toxic and may have harmful effects on those handling such objects. The final speaker was Jill Norwood, (Tolowa) Community Services Specialist at the National Museum of the American Indian. Jill spoke of various resources available to Native museums and cultural centers through the NMAI Museum Training Program. 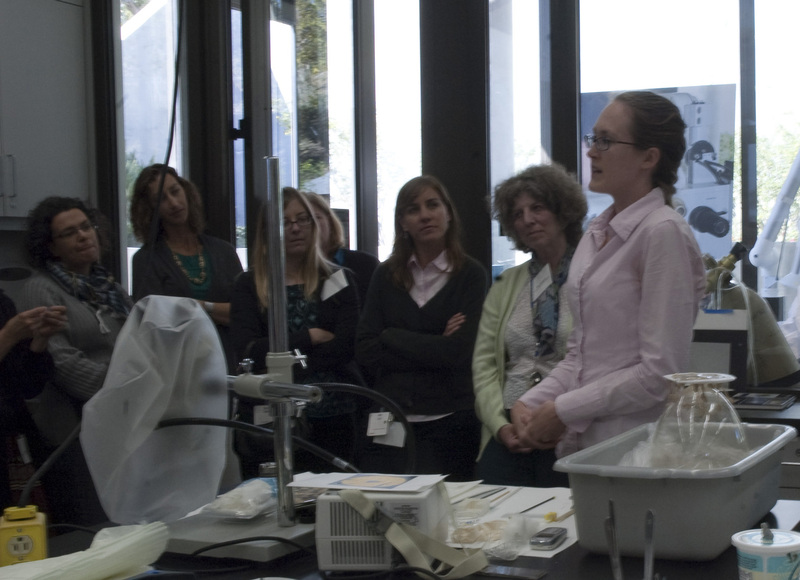 The workshop concluded with a tour of the UCLA/Getty laboratories, during which we shared with the workshop attendees some of our current projects. The greatest part of the tour was when the attendees shared their unique knowledge and experiences with similar objects, in particular the beaded hide object and the feather headdress. The attendees’ information contributed to the overall understanding of the objects and their cultural context. Cindy Lee Scott (right) presents her examination and treatment of an African basket covered with leather. Elizabeth Drolet (center) explains how x-rays and condition diagrams have assisted in her treatment of a Pre-Columbian ceramic. Nicole Ledoux discusses her examination and ongoing treatment of a Plains Indian beaded hide object. The technical analysis of this object was presented at this year’s ANAGPIC conference that was held at Queen’s University in Canada. Robin O’Hern exhibits her impressive reconstruction of the base of a glass vase. To reassemble the many fragments of the base, Robin had to experiment with molds to use as a point of reference as well as devise creative methods to provide support to the base during the treatment. 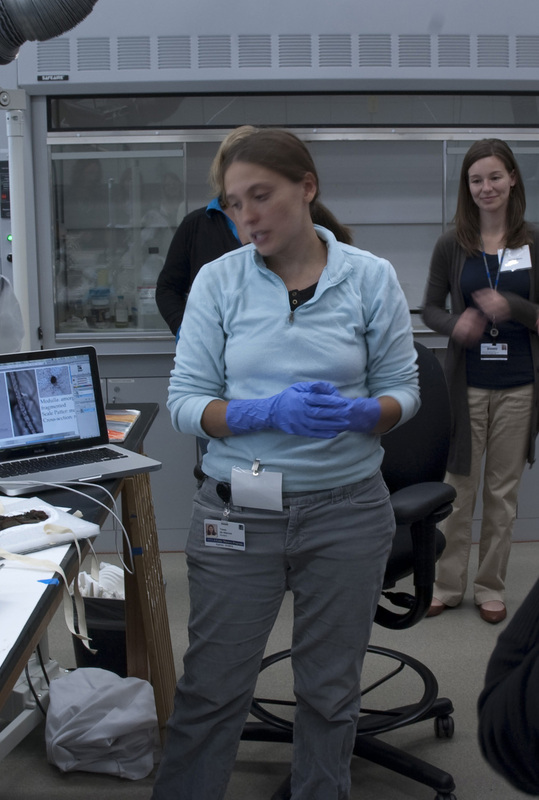 With her laptop at hand, Tessa de Alarcon discusses one of her favorite topics, how microscopic techniques may be used to analyze and possibly identify archaeological fibers. Dawn Lohnas explains the construction technique of a feather object, which was a replica of a Maidu headdress made for the education collection of the Southwest Museum. 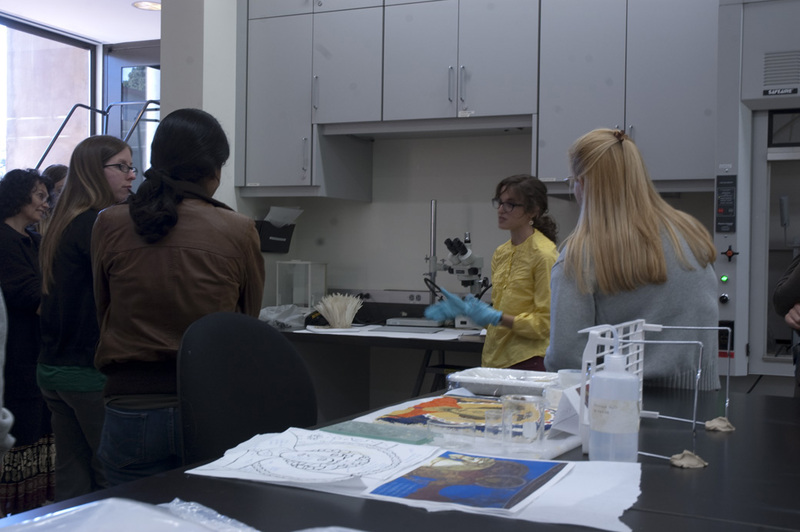 The students agree that one of the many strengths of our program is the emphasis on caring for tribal collections. 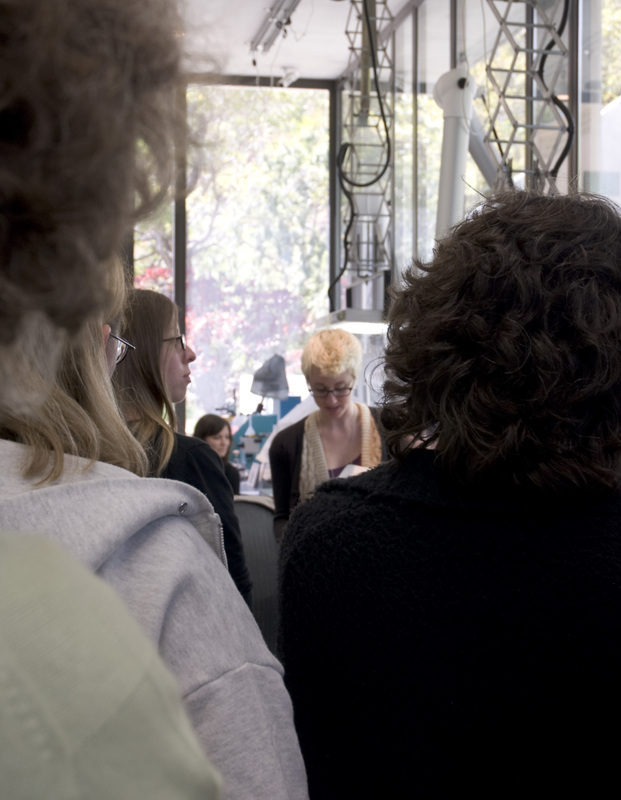 Collaborative efforts like this workshop offer the students a unique and enriching experience…and we are so proud of Professor Ellen Pearlstein as well as former UCLA/Getty Conservation students Molly Gleeson and Ozge Gencay Ustun! And we cannot forget, or thank enough, the amazing Vanessa Muros for her never ending assistance. After the workshop ended, we diligently returned to our studies and numerous projects as we finished up the whirlwind that was our first year in school. By now, many of the students have packed their bags and left for various parts of the world for their summer internships. Categories: Curation Tribal Collections, Workshop | Tags: conservation, curation, tribal collections, workshop | Permalink. This event is designed to benefit staff, interns and volunteers at centers caring for tribal collections in the greater Los Angeles area, and to introduce them to resources available locally, nationally, and especially at UCLA. This event is designed to expose tribal members already working in area tribal museums and archives to professional and educational opportunities, to expose younger tribal members to projects related to their culture, and to encourage them to pursue higher education in fields relevant to museum and archival work. Wendy Teeter, Curator of Archaeology at UCLA’s Fowler Museum: collaborating with communities in the curation of archaeological collections. Ruth Bahylle, (Pawnee/Choctaw) UCLA PhD candidate in Archival Studies: archival management for tribal collections. Ellen Pearlstein, Associate Professor, UCLA: incorporating tribal communities into graduate education in ethnographic conservation. Molly Gleeson, (UCLA M.A. ’08) former Conservator at the San Diego Museum of Man: resources for collections care for tribal communities. Özge Gençay Űstűn, (UCLA M.A. ’08) Assistant Conservator at the Southwest Museum of the American Indian: detection of residual pesticides applied to tribal collections and safe handling and response. Jill Norwood, (Tolowa) Community Services Specialist, National Museum of American Indian: resources available to Native museums and cultural centers through the NMAI Museum Training Program. Categories: Uncategorized | Tags: conservation, curation, tribal collections, workshop | Permalink.